(MP036). W L Wyllie (1851-1931). Watercolour signed not dated..
Standard size: 12 x 7ins (31 x 18cms) approx. 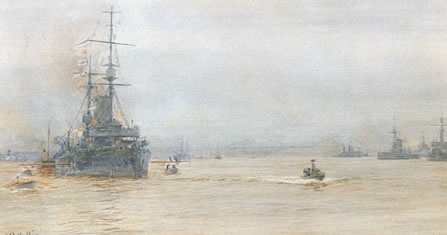 A soft , grey and misty day in the Forth as battleships of the KIng Edward VII Class lie to their anchors, pinnaces plying to and fro, boats lying at their booms, a cutter pulling past in the left foreground. The new battle cruiser TIGER is over on the right. Ships appear to to be raising steam? Clever Wyllie has it all, from the subtle colours to the action and movement everywhere.